Volunteers are essential to the work we do at Starhill Forest! There are opportunities for individuals and groups of all age and ability levels. See the calendar for information on upcoming volunteer events or contact Alana McKean at alana.mckean@ic.edu to schedule another time to contribute your talents. See some examples of volunteer opportunities below. Individuals and groups can assist in maintaining our perennial beds and doing routine landscape maintenance such as weeding, watering, mulching, potting, planting, pruning, and general spring and fall clean up. Gardening experience is helpful, but not necessary. Learn to recognize the most common invasive plants that occur at Starhill Forest, and help to eradicate them! This can be done year round, though most commonly in spring and fall. During this time of year, invasives are generally easiest to spot and the weather and conditions are most ideal. It can be as easy as taking a relaxing walk in the woods and pulling some pesky plants along the way! 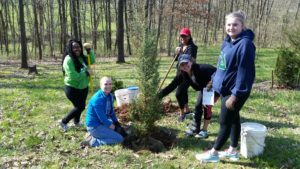 Be part of arboretum events by helping with setup, parking, activities, and clean up. Please contact us for upcoming opportunities. Enjoy a walk in the woods while you help with trail maintenance! 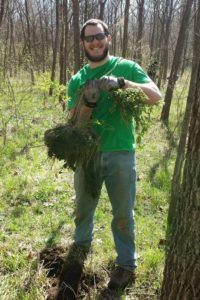 Trail stewardship involves removing fallen branches, clearing brush, and reporting problems and safety issues that require further attention. We welcome visitors who wish to try their hand at nature photography. If you wish to share some of those images, we may use them in the newsletter, on Facebook, the website, or other publications, with credit, of course!